From the outside, Souk Kitchen looks like one average sized room with a bright and colourful menu posted on the window. The bright pink, yellow and blue of the menu is not exactly what I expect from middle-eastern cuisine with its modern brightness. I also find it surprising that they do a breakfast menu but it’s 11.40am and it will have to do since the Tobacco Factory does not open until noon. We are seated quickly at the last empty table and the service is friendly. The dark brown tables look similar to the ones at Flinty Red and the wooden white chairs are comfortable. The place itself though is so loud. We can barely hear ourselves across the table and have to repeat things and point to menu items. There are 10 tables in the restaurant and four of them are playing host to infants. There’s a very cute six-seven month old who finds it entertaining to practice her new noise-making skills. At the start of the meal this is lovely but by the end it has become mind-numbing. The food specials sounded delicious and colourful but I didn’t think there was much you could do with breakfast. I was wrong. They had ‘the local’ for £6.25 which comprised Lincolnshire sausages, grilled back bacon, two free-range fried eggs, fresh grilled tomato, sautéed mushrooms, homemade bubble & squeak cake, toast with butter + jam or marmalade; eggs on toast with possible extras; basket of toast; basket of pastries; granola;and french toast with the possible toppings of – cinnamon +almond French toast, with seasonal fruit compote, crème fraîche and maple syrup £3.95, – Crispy bacon, grilled banana and maple syrup for £4.50. I didn’t go with any of those and instead we both chose something that sounded more like a special, the Shakshouka, which for £4.95 was described as a typical Middle Eastern breakfast dish of poached eggs cooked in a sauce of tomatoes, peppers, onions + spices, served in the pan with homemade zatar flatbread (extra grilled merguez sausage £1.50 or feta 50p). I ordered mine with both sausage and feta while companion chose only the feta. 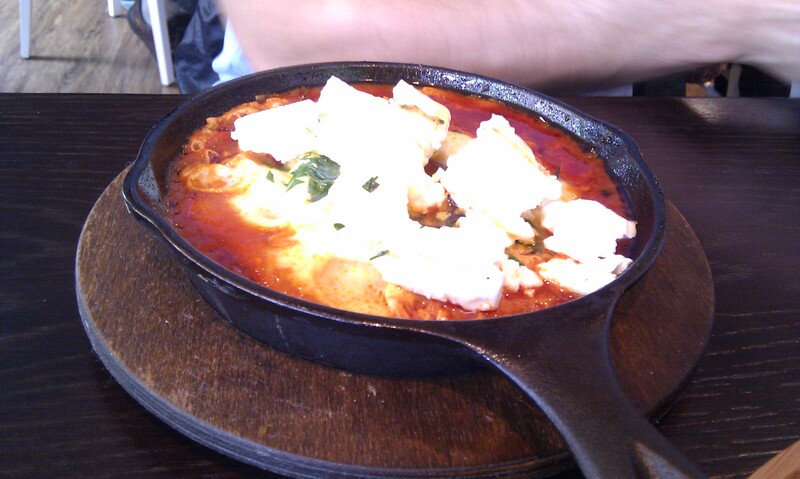 The dish was very tasty and the eggs were cooked (poached) well but with a yolk still runny while the whites were firm. There were peppers in the sauce which itself was well seasoned and fresh tasting. The feta cheese was very good, and I’ve tasted many varieties over the years. This was a salty and firm cheese that wasn’t too sour while the heat from the food helped it become even creamier. 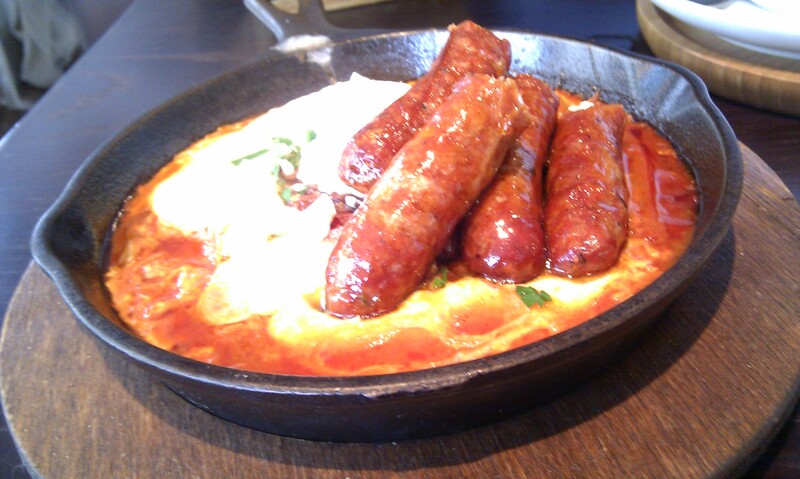 The sausages were firm and spicy and well suited to the dish. 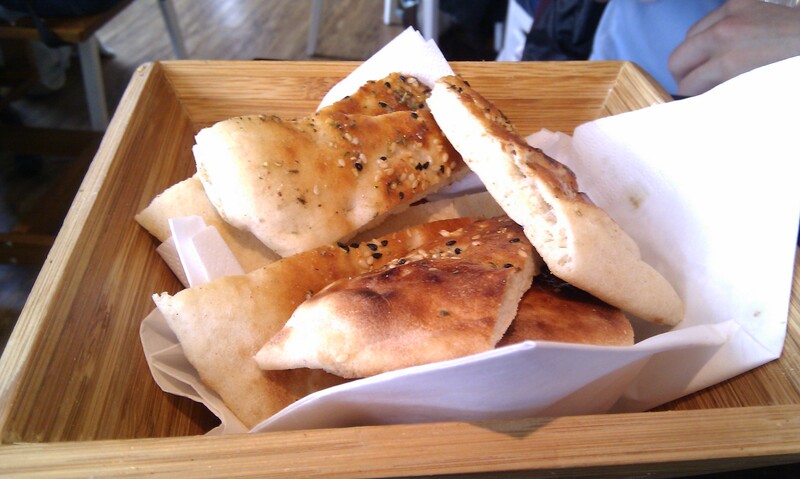 The breads were also very good with a spicy rub as a topping and served warm in a basket. I ordered a decaf Americano which I enjoyed and there was a special little touch of bringing heated up and frothed milk as an accompaniment (a shame I didn’t use it). 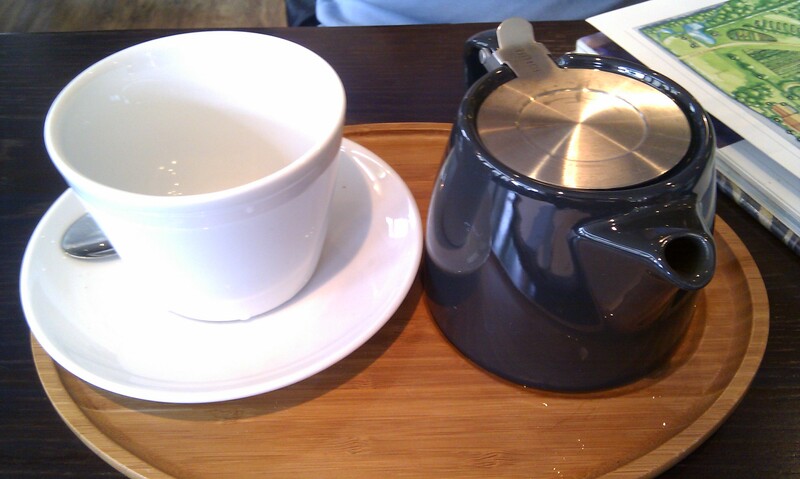 My companion ordered a green tea which was served in an individual teapot so that it was freshly brewed from tea leaves rather than a tea bag. If I was awarding marks then Souk Kitchen would easily get 5 / 5 or 10 / 10 for food. The service and atmosphere, however, were a whole other story. Admittedly there were only two people serving and while the guy seemed distantly friendly, the service from the woman was poor and sloppy. My coffee was sloshing away as it was placed down with the waitress barely breaking stride before she was off to the table behind us. I saw her smile only once when an older woman walked out after asking her a question and not waiting for a reply – it was more of a ‘why are people so strange’ expression that included a smile. It was the kind of service that didn’t expect a tip so I didn’t leave one. The noisy children and the groups of people on tables made the place very loud and conversation for us was nearly impossible. I ended up writing in my notebook while he read a book he had with him. They sound quite hard to resist. This entry was posted in Bristol, Food, Restaurants, Uncategorized and tagged Bristol, Food, food review, Restaurants, Souk Kitchen. Bookmark the permalink. What a great idea for breakfast! I would never have thought of having breakfast in a foreign restaurant. It looks like you didn’t expect that either. But it sounds like a great idea and great food too. The food was very good and you’re right it surprised me. North St has a few cafes and restaurants and this seems to be a bit of a mix. I’d never had that type of dish before. was it quite a trendy skinny girl who gave the ‘why are people so strange’ smile? Last time I went to Souk kitchen (although it was still Cafe Ceiturica then), there was a girl working who seemed quite bemused by my friends, who were -imagine! – ordering tea. Strange. No, it was an older woman but similar attitude. Thanks for the comment.